This week every morning when I have been getting my face on and my hair done I was very very conscious of all of my strange little beauty ticks and habits that have become second nature to my routine and since you guys seemed to love my weirdie cinema post a little while back I thought I would share a bit more of my strangeness with you! So here we have my 5 biggest beauty weirdie ticks and habits. #1 When I buy a tin of anything, like hairspray, dry shampoo or basically any aerosol spray with a lid, I bin the lid. I'm not entirely sure why and I only do it to cans over a certain size, for example my handbag sized tins with lids are safe. I think it might just be because I'm so lazy and taking a lid off to spray my hair in the morning is wasting extra time I just don't have. #2 No matter how prepared I am I will almost always accidentally apply my lipstick and liner before brushing my teeth and end up with a face / teeth of disaster before leaving the house! #3 I am a beauty hoarder, recently I threw out a massive black bag full of make up and accessories I have ashamedly been keeping 'just in case' for 6 years! The first stage as always is being able to admit you have a hoarding problem. #4 I have a brow kit in which there is a gel to be used to set stray hairs after you have applied the powder. However I use it as a prep as I find it helps my brows stay darker and ruly for longer. #5 I am very strict about my beauty prep environment, I must have music / tv noise and a full glass of orange juice / diet coke or my face just won't cooperate! So ladies and gents that's me for now, my weird and wonderful beauty routine musts and mustn't's letting you guys see a little bit more of my strange little ticks and habits that make up my own Granite City living. 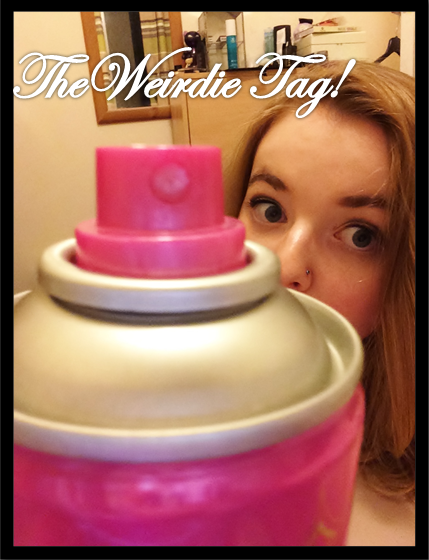 I know this is technically a tag but I have nobody specifically I would like to tag to try out this post but I will say I challenge all of you lifestyle and beauty bloggers out there to give this a bash and share some of your wonderful weirdness with the blogosphere and the world! I hoard everything beauty wise too haha!